No matter how long you’ve been driving, it’s never too late to learn better habits. 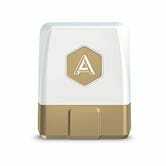 Automatic is a little Bluetooth dongle that plugs into your car’s OBD-II port (found on almost any car made since 1996) and communicates with your smartphone to track driving habits, mileage, and engine problems. It can even trigger IFTTT recipes and integrate with Alexa. But best of all, if you’re in an accident, Automatic will automatically alert the authorities and call your family, no subscription required. The Automatic Pro includes always-on 3G connectivity with no monthly fees, meaning you can track you car’s location no matter where you are in the world (assuming the car itself is located in the United States). It usually sells for $130, but right now, Amazon’s knocked that down to $100.